Google Music is out of beta and users can now buy songs, but only in the US. Business Insider reports that the store has 13 million songs from 3 major labels (EMI, Universal, Sony) and other independent labels, self-released artists can upload their own songs and T-Mobile customers can pay for songs on their phone bills. 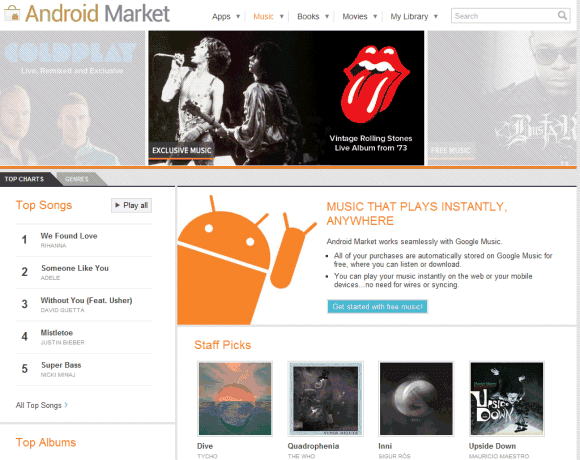 Google Music Store is available in the Android Market (both the web interface and a new version of the mobile app that will be released soon). A surprising feature is the integration with Google+: "if you use Google+ to share a song or album with someone either privately or through a circle, the person who receives the share will get one free full play of the song or album. If you do a Public share, people in your circles will get one free full play of the shared song or album. Everyone else who sees the share will get a preview." Google offers a lot of exclusive songs and albums, but you can't download the free songs from the store without associating a US credit card to Google Checkout. Google Music will store the songs you've uploaded or bought and now you can also download them. For example, in the web interface, click the arrow icon next to a song and select "Save to computer". The catch is that "you can only download each purchased track from the web 2 times". To download all the songs you've purchased from Google Music, use the Music Manager app. "Google Music is about discovering, purchasing, sharing and enjoying digital music in new, innovative and personalized ways. Google Music helps you spend more time listening to your collection and less time managing it. We automatically sync your entire music library — both purchases and uploads — across all your devices so you don't have to worry about cables, file transfers or running out of storage space," informs the Google blog. Limit of 2 downloads seems arbitrary...what's the reason? Songs can be streamed unlimited times so it's not about network traffic. Songs *can* be downloaded (twice) so it *could* be shared illegally so it's not that. This is exciting, seeing Google getting into it. It's a pretty complete feature if you ask me, but I'm with these guys, what's with the 2 song download limit? That's a little odd. Wondering if it's at all possible to download your entire library again if you ever lost data on your local computer. Kind of lame that they aren't atleast making sure they match amazon.com prices or offering lossless versions. Lossless is really the only thing that keeps me buying cds. Why doesn't Google pay people in free music downloads? What I'm thinking here is: Google could get people to do market surveys over the internet, and then pay people for their time/work in either free music from the music store, or perhaps free movies from the movie store, or perhaps even more storage space. Here's another option. Right now, for example, if you allow Google ads on your blog, then you have to wait until you get $100 until you see any money from Google. Why can't Google pay people with free music or more storage space? At teh rate I'm going, I don't think I'll ever get close to the $100 point with my blog, and I'd much rather have that money in free music. Given the >9% unemployment, there's a lot of people with time available, and if Google could figure out how to (legally) tap into that pool of talent by offering free music downloads or increased storage space, then we might be able get more people working. Either way, thanks for setting up Google Music, I downloaded it immediately and already have it on my phone. I already have Amazon player on my phone, but now I have access to a lot more songs! When is it coming to Europe? Namely Sweden? Can't wait! I am a fan of electronic music and although I agree that Beatport is a great site, which gets a lot of music exclusively or early, I hardly ever use them because they are so expensive. I often listen to music on there and then hunt it down on other sites, such as Junodownload, 7digital, Boomkat or Bleep. But thumbs up to Beatport for having a good iphone app.